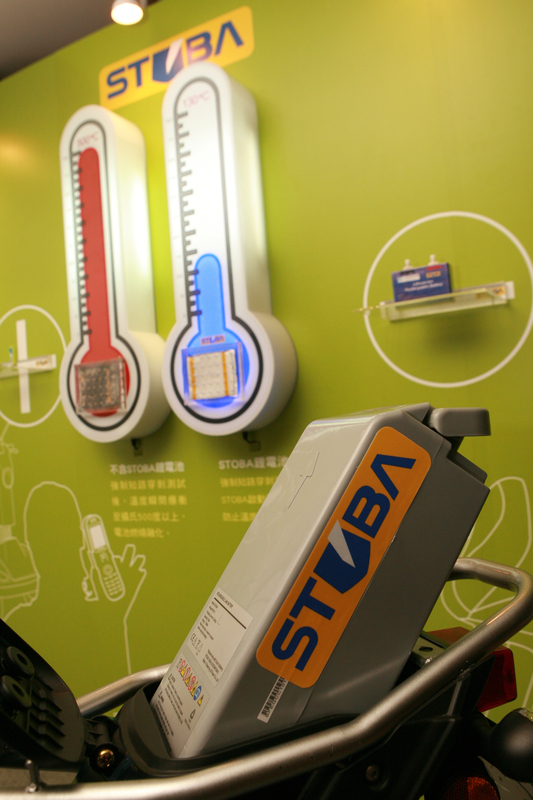 Industrial Technology Research Institute (ITRI) announced the establishment of High Safety Lithium Battery STOBA Consortium and unveiled STOBA trademark to establish a high safety battery standard on April 7th. STOBA trademark emphasizes safety and reliability as well as strength and durability. It also symbolizes the emergence of a new generation of precision lithium batteries. HSINCHU, TAIWAN--(Marketwire - April 13, 2010) - Taiwan's Industrial Technology Research Institute (ITRI), which has been emphasizing the R&D of electric vehicles and green energy, announced the establishment of the High Safety Lithium Battery STOBA Consortium and also unveiled the STOBA logo to establish a new standard. The Consortium was founded with the objective of driving the forward deployment of Taiwan's battery industry in the emerging electric vehicle market in the hope that Taiwan will become one of the top three lithium battery producers in the world. The technology is forecasted to create $4.5 billion (U.S.) in investment and 50,000 employment opportunities. ITRI President Dr. Johnsee Lee stated that the Taiwan government has been actively promoting green policies. In order to speed the transformation and upgrade of the local industry to boost competitiveness, ITRI has placed electric vehicle lithium batteries on the list of key green energy R&D projects. The global production value of electric vehicles and lithium batteries is forecast to reach at least $45 billion (U.S.) by 2020. ITRI aims to help Taiwanese companies gain the initiative in this emerging industry. Chairman Chen-yuan Gu of Molicel, Taiwan's battery industry leader, stated the long term cooperation between Molicel and ITRI has led to the technology transfer of STOBA. Mass production of high safety lithium STOBA vehicle batteries is slated to begin in the fourth quarter of 2010. The establishment of STOBA Consortium is initiated by ITRI, and nearly 20 companies have joined. The Consortium will help upstream, midstream and downstream cooperation in the domestic battery industry and drive its horizontal integration. It also aims to allow the smooth entry of Taiwan companies into the supply side of global system manufacturers. After receiving the global R&D 100 Award for its STOBA technology, ITRI became a focus of attention for a number of world-class battery manufacturers. The material manufacturer A123 System, battery maker Panasonic and other prominent companies have inquired about possible cooperation. Alex Peng, MCL deputy general director and leader of the STOBA Consortium, said the main work of the Consortium will be assisting Taiwan's battery industry development. The R&D team will continue to develop even safer lithium battery technology, assist companies to establish STOBA material and lithium battery manufacturing capabilities, gradually set up safety standard operating procedures and testing technology, and unify electric vehicle product safety procedures, enhancing Taiwan's international competitiveness. The freshly developed high safety lithium battery STOBA trademark emphasizes safety and reliability as well as strength and durability. It symbolizes the emergence of a new generation of high safety lithium batteries. Certification will be granted once companies pass the testing standard. In the future, STOBA will become a byword for high safety lithium batteries, and ITRI will gradually promote an international standard for high safety lithium batteries. STOBA (Self Terminated Olygomers with hyper-branched Architecture) is a nano-grade high-molecular material that forms a protective film when added to a lithium battery. The film acts just like an electrical fuse at a nano level. When a lithium battery experiences overheating, external impact or puncturing, STOBA instantly produces a sealing effect which prevents overheating by eliminating internal short circuiting and chemical reaction, thereby ensuring the safety and utility of batteries for 3C products and electric vehicles. STOBA technology has passed shorting and puncturing testing more rigorous than international safety standards, making it a world-leading, material-based technology innovation that solves lithium battery safety concerns. STOBA is an innovative technology from ITRI. This new generation of high safety lithium battery technology that is both durable and reliable will act as a source of differentiation for Taiwan's battery industry and a guarantee of greater safety and durability for consumers. If Disney stands for entertainment and BMW represents the ultimate driving pleasure, then STOBA symbolizes safety. Safety is the innovation core of the STOBA logo. The "O" at the center of the logo acts a solid shield, which delivers a strong and clear message of protection. Light is the highest form of energy. The white light from the shield is "controlled energy." The oblique rays of white light add energy to the solid shape. The two circles of opposing colors -- yellow symbolizing warning and blue representing safety -- create a powerful contrasting effect in the logo like positive and negative electrodes. All energy comes from conflict or opposing forces, but the energy contained within has a steady and stable appearance in the symmetrically sided layout and clear lines.